Lynette has been at BRAIN since 2005, first as managing editor. Before joining the magazine, she was an editor and writer for another trade publishing house in Southern California for close to five years. In addition to road riding, she’s an avid scuba diver, a hobby that has allowed her to explore more remote and exotic parts of the world. A California native who graduated from the University of California at Irvine with an English degree, she currently resides in bike-friendly Long Beach with her husband, who recently took up cycling. 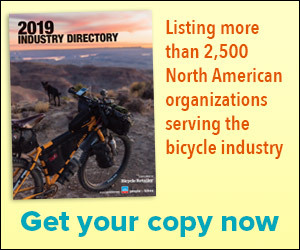 BOULDER, Colo. (BRAIN) — While supplier's dollar business in bikes for the month of August was flat with August of last year at $120 million, bikes shipped to retailers were down 40,127 units, according to the latest figures from the Bicycle Product Suppliers Association. Pricier bikes, especially e-bikes, are driving the trend in wholesale shipments. ASOLO, Italy (BRAIN) — Selle Italia has hired business development firm Lucidity to help it expand in the U.S. market. The Italian saddle brand is opening a warehouse, and sales and marketing office in Carlsbad, California. DETROIT (BRAIN) — U.S. bike manufacturer Detroit Bikes, which sells bikes that are made with U.S.-sourced chromoly frames from its factory, is being approached to handle bike assembly for other brands. LAGUNA HILLS, Calif. (BRAIN) — New label requirements for California Proposition 65, a law requiring that products sold in the Golden State warn consumers about exposure to chemicals that can cause cancer or birth defects, are going into effect Thursday.